Flowcharts are used for graphically visualizing a matter. Rather than just having a theory based knowledge, if the learners are provided with graphs, charts, symbols, diagrams, etc. the knowledge are believed to be most strongly imprinted in their minds and thus help improve the overall result or outcome. But, actually having to draw a flowchart using a pen, the paper might seem harsh, especially when there are many complicated things to be explained. So, with the advent of flowchart software, it becomes really simple to design your flowcharts according to your needs and demands. Here's a list of top flowchart software for your varying needs. This software can be used for various needs like documentation of a decision flow or the approval process, illustrate a particular software or product development and production process, create an infographic etc. It is an HTML 5 based diagramming tool so it is twice as fast as Flash and can be operated on any type of modern web browser. It supports an easy drag and drop interface. Even while being on the browser itself, you can edit your flowcharts and share them by just sending your URL to the required people. They even come with various types of templates and themes that can help you get started on developing a software. On the free account, you can afford up to 5 free diagrams (2 MB limit) and after that you need to shift to the paid versions whose price starts from $3.99. 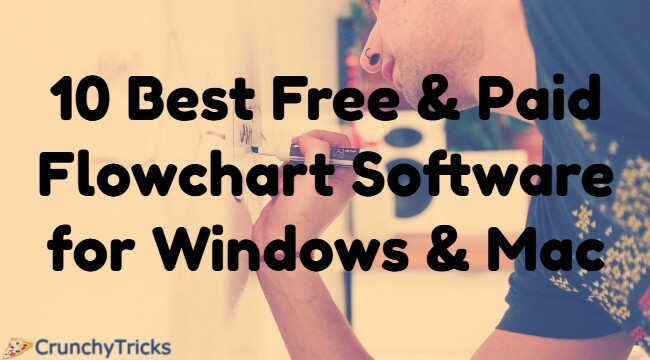 This is one of the old and most recognized chart creating tool that offers you a lot of varieties and features and can work correctly on Linux, Windows and Mac OS, X. It has 10 new amazing fonts and themes that are cross-platforms and open-sourced and thus can help you beautify your maps and charts looks. The three essential parts are relationship, boundary and summary where the relationship between and two topics on a graph on a map can be shown with the help of customized lines, Boundaries let you emphasize on a certain topic or content by making a closed area over those contents and the summary provides you with a lucid overview of those topics. This software makes use of marker to highlight any relevant matter or any type of priority or progress, etc. For each subject, you can give a single or numerous label depending upon your uses and needs. Presenting your job or slide becomes even easier with the help of slide-based presentation. It does come with a free plan that is useful for very basic use, but if you intend to use it with more advanced features then you can purchase a license to extend their functionalities. This powerful desktop application can run for free on Windows, Linux, Mac OS X and all other Java Virtual Machine Supported platforms. Along with the intuitive user interface, it also allows you to import data from .xls or XML files. With the help of pre-made templates, the entire process of designing a flow chart will be made even easier. You can bring in various documents, images and designs from other sources into yED and the software will arrange them into a full-fledged top quality flow chart. Even if your diagram consists of the many complexities and diversities, the software will untangle them and give you a simpler looking layout to make your understanding better. yED makes it easy to create, edit and handle diagrams by making use of simple mouse, touch and keyboard gestures. It also covers a broad range of deployment and platforms so that you can run it on your own platform. Lucid Charts come with an intuitive and collaborative diagramming solution that attends to all your varied types of diagramming worries. It also offers high compatibility with other programs like google apps and also provides support with Microsoft visio documents. It has separate categories and functionalities for making flowcharts for producing engineers, business related work and to design related work. As it is not a software, but an online web page, so you need not have any updating software problem or no additional downloads, etc. The simple drag and drop options and scalability option really perk up your flowchart making experience. Also, as it is built on HTML 5 and web standards so, it can function correctly on almost any major browser or Internet-enabled device. This offline tool supported by WYSIWIG based software come with over 1000 ready made templates and examples that can serve almost every type of your need, just to make your flowchart creating experience really free from problems. With the help of one-click create, drag and drop shapes, easy arrow heads and styles changing, simple aligning, sizing and grouping etc. the flowchart becomes very easy to draw. Sometimes when it's difficult for you to draw a shape to represent some idea or text in your flowchart, then you can just write it down as a text and the software will change it to complex forms accordingly. With the help of connectors, lines and shapes can be matched correctly to the linking forms. With the aid of real-time collaboration, you can invite anyone to collaborate with your flowchart and if they make any change to your flowchart then it will be visible to you simultaneously and they can even leave you their own comments and reviews regarding the necessary modifications in the flowchart. Also, if you want hen you can import visio and visio stencils directly to your working field on Creately. You can also import your flowcharts to Abode Illustrator, Inkspace, MS, Visio etc. for modification. It is compatible with Microsoft Windows, Linux, Mac OS X and the price is free for up to 5 diagrams and then you will be charged with minimum $5 per month. This notable drawing software comes with varied range of applications and features, thus making it one of the most sought after drawing tool. You can also include shapes, photos, images and diagrams using keystrokes and keyboard. With nearly 100 of templates and 70 different types of diagrams, charts, and other visuals, your whole process of flowchart creation becomes really simple. With the help of Smart Draw cloud, you can create and edit diagrams in modern browsers on both Mac and Windows. As it offers high compatibility, so you can export your diagram to Word, Excel, PowerPoint or Outlook and can also save your drawing to Dropbox, Google Drive or One Drive. Furthermore, with the help of built-in examples and drawing tools, the process of creating a complex flowchart becomes extensively straightforward and easy. This diagram application is free to use and offers excellent solutions and offers to build your flow charts. It is made on Google Drive (TM) using which you can create not only flowcharts but also UML, entity, relation, network diagrams, etc. With the help of simple drag and drop techniques, it becomes easy for anyone to use this free application. As soon as you visit the website, you can get on with drawing your flowchart without wasting any time on unnecessary registration information, login details, advertisements, etc. The files get saved as a .xml file and can be used by various other programs. You can export your diagrams in the format of .jpg, .png, .pdf, .gif and .svg so as to enable the method of sending the file via e-mail or sharing them with others. One of the most attractive capability of draw.io is the availability of basic vector graphics. Your diagrams get saved to the Google Drive, so you don't have to be afraid of losing them. You can also resize, move or copy the images in your diagram according to your needs. This software comes with lot many varieties of clip art and simple vector images to ease the process of flowchart creation. Furthermore, with the help of the option "Find Stencils On the Cacoo Store," you can search for even more clip arts and vector images. It can work on any PC and is also available as an app for Android users. With the help of the free account, you can save up to 25 sheets of diagrams. Then to continue using the services you can pay a minimum amount of $4.95 per month and become a premium user. Your charts are sure to be saved, secured and synced so that you can open them or use them whenever you need. Also, it offers you the option of viewing real-time changes in your app and gives you the option of in-app chat. Your diagrams can be exported to various other formats like jpg, png, pdf, etc. It is used for creating a professional looking layout. Using this software, the creation of flowcharts, sitemaps, wireframes, basic symbols, etc. is possible. It works fine with Desktops, the web, and iPad. The Android version of this software is currently in progress and will be available soon. The user interface is too excellent and easy to understand and use. With the help of simple drag and drop option, you can add desired contents and images to your flow chart. The files and flowcharts can be exported in .png and .jpeg format. The desktop version comes free of cost, but it has a particular disadvantage that the features on the desktop version are limited compared to the web and iPad version. The paid version plans start with a minimal amount of $3.99/year. This free, open source online diagramming software functions correctly with Windows XP, Vista, 7, 8, 8.1, 10, Linux and Mac OS X. This software carries features that are highly similar to Microsoft Viso app. With the help of this software, you can easily create various diagrams like Flowcharts, UML diagrams, Assorted Diagrams, Circuit to Network Diagrams, etc. on the go. It is also a storehouse of a large variety of symbols and tools that can ease out your process of diagram creation. Also, you can work simultaneously on more than one flowcharts or diagrams on multiple tabs. Your layouts get loaded and saved to a custom XML version which can then be exported to several formats such as XFIG, PNG, EPS, WMF or SVG. Moreover, if necessary the software allows you to take a printout of your diagrams too. It is the overall list of all the flowchart creation software, which can give you a well looking professional flow chart for any your need.